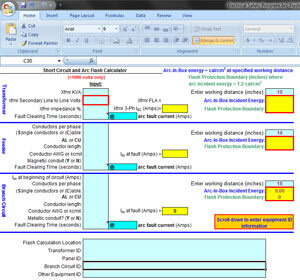 This Excel file combines arc flash equations from a proposal to NFPA 70E-2003 with simplified equations to calculate available fault current. This tool uses methods that have been shown to result in conservative estimates of fault current, which should result in conservative estimates of arc incident energy if appropriate arc fault clearing times are used. An IEEE 1584 equation is used to calculate arcing fault current. That is the fault current value that is used to determine the clearing time of the overcurrent protective device ahead of the potential arc fault location. Electrical engineering should be consulted to obtain information on fault clearing times. This spreadsheet is not intended to replace existing up to date fault studies or support of experienced electrical engineers, but is one tool that can assist engineers, planners, and electrical safety POCs in performing a flash hazard analysis. Arc flash calculation is not an exact science and caution is always necessary, including use of multiple alternate methods that are available to verify results and ensure the highest level of safety based on the best information available. According to the NFPA 70E Technical Committee on Electrical Safety Requirements for Employee Workplaces, This proposal presents the best information available to date on arc fault hazards. Public review and comments are strongly encouraged. Recent testing has enabled development of improved equations for calculating the arc flash incident energy at the arc flash boundary. While the testing and development of methods is not complete this proposal contains methods that reflect significantly more laboratory data than the existing methods and will allow improved safety. This calculator is for use only with systems operating at less than 1000 volts. If any doubts exist on use of this spreadsheet, or to perform a flash hazard analysis on systems operating at more than 1000 volts, consult with an electrical engineer or other knowledgeable person. Where can we buy the short circuit flash calculator? Would be nice to see a metric version for use with metric dimensions and SI units. I try to download an application but it says to login first. I login in but then cannot get back to the download page because I’m on another website you have directed me to. A nice Catch-22. Try now. There was some modifications in portal. Please let me know if you still have problems with downloading. i need a software for Earthing…. could you suggest any? Maybe we’ll add some software for it in near future. Good Teach-Yourself course on Earthing is available at the following http://www.cbt44.com. I am studyng a master on electrical engineer, and the information shown very useful and interesant. Thanks Diego! Hope you found what you were looking for!